BORP Benefit concert at Ashkenaz! programs in several other cities across the state. I wanted to thank all of you that took part in this year’s Revolution cycling event. It was an amazing day up in Sonoma County and after the fog burned off it was a beautiful day. Even the fog was welcome after the scorcher we had last year. I wanted to take a minute and share the share some of the photos of the event where some of the Bay Cruisers wheelchair basketball players rode the 10 mile course. These kids trained all summer long preparing for the event. We had several kids that went on the 25 mile course too. Those photos will be up soon. Thanks again to all of you that rode along with, supported, or cheered on our young athletes. The wheelchair basketball season kicks off this weekend in Paso Robles. The Paralympic Training Camp September 21-28 was a lot of hard work. Sam had a blood test and physical on the first day and then worked out every day. In the evenings he would watch film of his day’s throws, watching to see where he could improve. The coaches told him to increase his calories and reduce his fats and sugars so breakfast has become two egg white sandwiches on whole wheat muffins with a little margarine and lunch is now 2 chicken or turkey sandwiches on whole wheat with two apples and a bottle of water. He’s actually trying to increase his overall water intake, drinking a bottle of water every time he thinks about it. As big as he is, the Paralympic coaches told him he was operating on raw strength and recommended that he begin a serious weight lifting regimen. With his brother Matt’s wedding coming up on October 3, Sam decided to wait to begin the intensive weight training until after his role as co-best man (with brother, Brad) was over so he would fit into his suit! The wedding was beautiful. Telluride Colorado, was ablaze with fall colors, getting us all ready for the beauty of the wine country and the Revolution! The weather during the wedding weekend was perfect and the bride and groom, “one person” as Sam said in his toast, rode off in the gondola with a “Just Married” sign in the back window. Back in Walnut Creek, Sam has been heading to the gym every other day. He is working on building strength in his Lats, Triceps and shoulder muscles, lifting 270 pounds and up with Brad as his spotter. Brad is getting some lifts in, too, with Sam spotting (He waited to lift so he would fit into his suit, as well!). Sam is also working on strengthening his right leg, as he can get some extra push from it when he throws the shot and disc. Stretching and resting the muscles is critical. When they come home, Sam ices his shoulder and stretches it across his chest. He is practicing his throws a couple of times a week and lifting every other day. It’s important to keep from injuring anything. As a member of the US Paralympic Team, Sam has had to register with the United States Anti Doping Association and keep them informed of his location at all times, including Telluride and the Rev. They came to his apartment a couple of months ago at 6am to test him! It’s important for Sam to watch everything he eats and drinks. Energy drinks can contain banned substances (like Taurine). If he gets a cold, Advil and Sudafed PE are ok but the full strength Sudafed is not allowed. Revolution here we come! (USADA has been notified) Riding the hand cycle is perfect cross training. Pulling back on the handles provides an opposite motion to the everyday wheelchair pushes. Riding is also a great aerobic addition to the training routine. The cycle is tuned and ready for next Saturday and so is Sam! The Borp Revolution Ride is on it’s way! The Rev, now in it’s eighth year has helped BORP to provide a plethora of adaptive sport opportunities for people with disabilities including wheelchair basketball, goalball, power soccer, and outdoor adventures including camping, scuba diving, and rock climbing. Set in the bucollic Sonoma wine country, riders enjoy a variety of fully supported courses including a 100, 65, 50, 25, 10 mile ride. The event brings cyclists of all abilities, ages, experiences, and motivations together for a day of riding and festivities. How does your participation help? Here are just a few examples of what $100 can help us to provide: a power soccer ball, a goalball, two pairs of adaptive foot pedals, a basketball uniform, a one year participation fee, one replacement bicycle drivetrain; however, while we all have some idea of what can be purchased with cold hard cash, there are many intangibles that are more enduring and more valuable than material goods. BORP’s effect on it’s participants includes increased self-esteem, increased independence, social integration, and an increased level of self-efficacy. So a big thanks if you are riding or volunteering this year. Thanks also if you are supporting a rider or plan to make a donation to our silent auction. THANKS FINALLY to everyone who is making The BORP Revolution Ride possible! When I first found BORP in September 2006, I was ending my last year of graduate school at UC Berkeley’s Goldman School of Public Policy and looking forward to finding the perfect job where I could excel. In addition to owning a home and getting married, this was one of my last major goals in life. I was a woman. I was a daughter. I was a policy analyst. 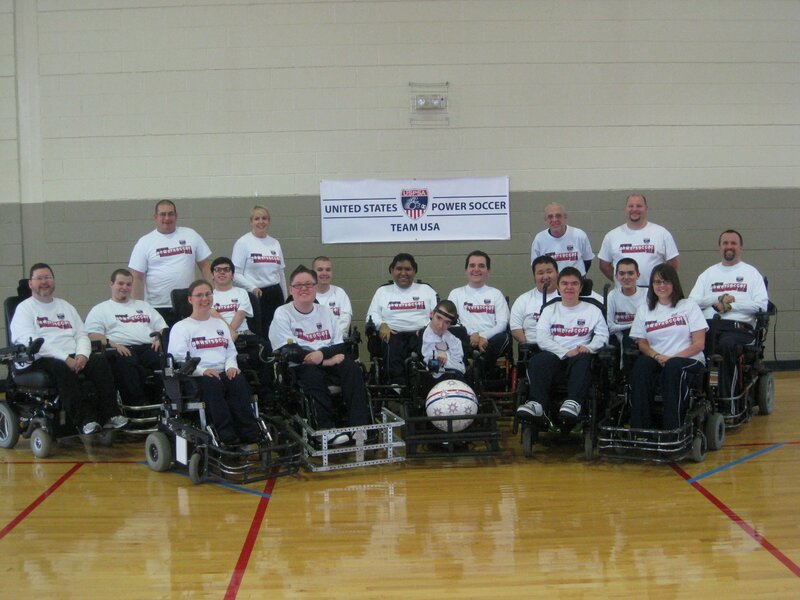 At the same time, one of my good friends and BORP power soccer athlete Jessica Lehman was in the midst of her journey toward becoming a world champion with the National Power Soccer Team USA 2007. While I admired Jessica for her individual power soccer skills and dedication, I admit I was perplexed at how an individual with a disability could justify the amount of time and effort given to a sport. I had never before been taught that people with disabilities could or should want to be athletes. I had dismissed all sports-related activities from my life until, as part of a favor, a friend convinced me to attend Opening Day. As a new member of the BORP power soccer team, Jessica offered to help me learn the sport if I could show up regularly to her individual Team USA practices on week nights. Over the next six months I soon found this new activity becoming a way of life. Power soccer gave me a thrill I rarely felt through academia or other aspects of my life. The sport offered to me new challenges and new accomplishments. My team mates encouraged me have a new perspective on life. While maintaining my academic and vocational achievements, it was acceptable to plan a life with athletic goals. If I permitted myself to step outside of the boundaries others had imposed on me, I could imagine the possibilities of excelling in sport. I, too, could be a great power soccer athlete. Perhaps, I could even dream of being a World Champion. This past week was a significant marker for me. It has been both four years as a BORP athlete, and one year into my training with the National Power Soccer Team USA 2011. For 52 weeks I have spent week nights and weekends practicing drills and forming relationships with the eleven other Team USA athletes. I have completed over 2,000 stationary kicks toward a cone, made hundreds of 180-degree kicks into a goal, and spent over 100 hours at the gym in preparation. Team USA 2011 is nearing our fourth training camp at the end of this month. All twelve athletes, coaches and staff will meet in Birmingham, Alabama at the Paralympic Training Center to continue our journey. With just one year until the next World Cup in Paris, France, Team USA intends to train with focus and passion to become repeat champions! And while Jessica and the rest of my BORP team mates are not part of the National Team USA 2011, the unwavering support, friendship and leadership I receive from them on a regular basis is a key to my success. I am grateful to have met Jessica at such a significant time in her life that she could inspire me to dream big – in fact – inspire me to add a new definition to who I am: Athlete.